The mother-daughter duo behind Garden Design lightens up a Nantucket guesthouse. When Brooke and Elise Garden, the mother-daughter duo behind Garden Design, were hired to transform this Nantucket residence, the directive was simple: Create a retreat that was light, fresh, and reflective of the island’s natural charm. “The goal was to create a fun and relaxing escape from the real world,” says Brooke, who began working with her daughter after she graduated from Harvard last year. Together, the Greenwich, Connecticut-based pair puts puts a modern, earthy spin on interiors, and the familial partnership ensures things are sophisticated and functional, yet young and playful. Initially this 3,000-square-foot residence was very dark and dull. But it had a good layout with three spacious bedrooms, two bathrooms, and a kitchen and living room upstairs with peeks of the sea. 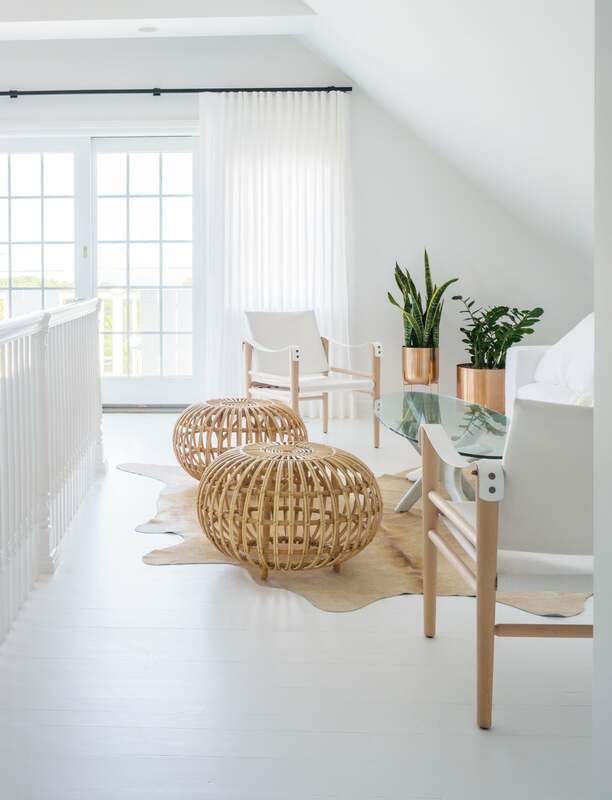 To brighten things up and highlight the ocean views, the Gardens swathed the walls, floors, and ceilings in Benjamin Moore’s Decorator’s White for the ultimate head-to-toe refresh. “Keeping the walls and the floor the same lends itself to showing off the items in the space as opposed to having contrasting floors,” Brooke says. “We chose all of these elements—the rattan, the chair, hammered drum tables—to mimic the feeling of an island retreat,” Brooke says. These natural fibers dot the other two bedrooms as well; the first is bright and whimsical with hot pinks, bright ocean blues, and a rainbow mirror that the designers chose for its “peaceful, whimsical” vibes. The second is adorned with palm print–bedding and rattan pendants hung loosely from ropes. Here black accents from Block Shop prints and a throw blanket put a bolder spin on the indoor-outdoor statement. Wood notes warm every room, especially in the communal areas. The kitchen previously sported old shaker-style cabinets and white linoleum countertops. Now it straddles the line between modern farmhouse and sleek minimalism, with butcher block counters and white shiplap walls juxtaposed against high-gloss cabinetry. Brooke describes the finishes as “almost opposites,” but notes that they “complement each other beautifully.” A lacquered rattan bar cart marries the designers’ practical-meets-cute mentality, offering storage on wheels that can move around easily while entertaining. Just off the kitchen, the dining area mixes tones and textures with a black rug to define the space against the white floor. “It almost feels like its own island in a white sea,” Brooke says. Across the room, a paler, chic seating area combines natural woods with white leather seats, copper planters, and a hide rug in all in lighter whites and tans. This vignette, set against white walls, floors, sheers, and French doors lends a cool and crisp, low-slung cocktail area that feels inviting in a modern beach house. The entire home is constant balance of natural materials and colorful whimsy, but both come together beautifully in the master bathroom, which is a complete postcard of island breeze. A floating vanity is contemporary yet organic, while graphic blue and yellow concrete tile is playful and transporting. Here they took an extra step to modernize the look, running it floor-to-wall, making it even more of a showstopper.